Based on the relative expression of CD11c and CD1a, we have identified three fractions of dendritic cells (DCs) in human peripheral blood, including a direct precursor of Langerhans cells (LCs). The first two fractions were CD11c+ DCs, comprised of a major CD1a+/CD11c+ population (fraction 1), and a minor CD1a−/CD11c+ component (fraction 2). Both CD11c+ fractions displayed a monocyte-like morphology, endocytosed FITC-dextran, expressed CD45RO and myeloid markers such as CD13 and CD33, and possessed the receptor for GM-CSF. The third fraction was comprised of CD1a−/CD11c− DCs (fraction 3) and resembled plasmacytoid T cells. These did not uptake FITC-dextran, were negative for myeloid markers (CD13/CD33), and expressed CD45RA and a high level of IL-3Rα, but not GM-CSF receptors. After culture with IL-3, fraction 3 acquired the characteristics of mature DCs; however, the expression of CD62L (lymph node-homing molecules) remained unchanged, indicating that fraction 3 can be a precursor pool for previously described plasmacytoid T cells in lymphoid organs. Strikingly, the CD1a+/CD11c+ DCs (fraction 1) quickly acquired LC characteristics when cultured in the presence of GM-CSF + IL-4 + TGF-β1. Thus, E-cadherin, Langerin, and Lag Ag were expressed within 1 day of culture, and typical Birbeck granules were observed. In contrast, neither CD1a−/CD11c+ (fraction 2) nor CD1a−/CD11c− (fraction 3) cells had the capacity to differentiate into LCs. Furthermore, CD14+ monocytes only expressed E-cadherin, but lacked the other LC markers after culture in these cytokines. Therefore, CD1a+/CD11c+ DCs are the direct precursors of LCs in peripheral blood. Dendritic cells (DCs)3 are bone marrow-derived professional APCs that initiate and regulate immune responses (1, 2, 3). Recent studies have demonstrated that DCs in situ can exist in different maturational states and pathways of differentiation. Subtypes of DCs with some differences in morphology, phenotype, and function include interdigitating cells in lymphoid organs (4), peripheral blood DCs (5, 6), Langerhans cells (LCs) in the epidermis of the skin (7, 8), dermal DCs (9, 10), and thymic DCs (11, 12). In the human tonsil, DCs in the germinal center (13) and plasmacytoid T cells in the T cell zones (14) have recently been identified as new DC subsets. Hemopoietic progenitors that differentiate into various types of DCs are present in the cord blood (15, 16), bone marrow (17), and peripheral blood (18, 19). At least two separate developmental pathways of DCs from CD34+ progenitors have been shown (16, 19): one pathway involves CD1a+/CD14− cells with the features of epidermal LCs. The other pathway includes a CD1a−/CD14+ intermediate that can differentiate into monocyte-derived or dermal DCs that lack LC markers. GM-CSF and TNF-α are required in both pathways, but TGF-β1 is found to be important for the formation of Birbeck granules and Lag Ag of LCs (20, 21, 22). It has also been found that peripheral blood monocytes cultured with a combination of GM-CSF, IL-4, and TNF-α differentiate into mature DCs (23), and that LCs may develop if TGF-β1 is added (24). The identification of DC intermediates in the peripheral blood is, therefore, important, because it is thought that most blood DCs are either en route from the bone marrow to peripheral tissues, or from nonlymphoid tissues to the regional lymph nodes and spleen. Previously, DCs were purified from the peripheral blood after a 1- to 2-day culture period. These DCs were morphologically, phenotypically, and functionally different from the DCs present in the circulation (25, 26). Recently, DCs have been isolated from the peripheral blood by immunoselection methods without culture. DCs thus prepared are not the morphologically typical DCs, and, interestingly, there are two subsets with distinct phenotype (27, 28, 29). The nature, origin, and commitment of these DCs require further analysis. In the present study, we have isolated fractions of blood DCs using magnetic beads and a multicolor sorting system. We have distinguished three distinct fractions by extensive surface marker analyses, and have examined their functions and developmental capacities. During these investigations, we have identified a distinct subset of DCs that quickly differentiates into LCs. Strunk et al. have reported that, in the peripheral blood, only CD34+ progenitors expressing the skin-homing receptor differentiate into LCs (after 10- to 18-day culture) (19). It has recently been reported that, in the presence of GM-CSF, IL-4, and TGF-β1 for 6 days, human peripheral blood monocytes (CD14+ cells) can differentiate into LCs characterized by the expression of CD1a, E-cadherin, Lag Ag, and Birbeck granules (24). We show in this study, however, that the most direct precursors of LCs in human blood are a distinctive subset of CD1a+/CD11c+/CD14− DCs. The following culture medium was used throughout experiments: RPMI 1640 supplemented with 2 mM l-glutamine, 100 U/ml penicillin, 100 μg/ml streptomycin, and heat-inactivated 10% human AB serum (ICN Biomedicals, Aurora, OH). Monocyte-conditioned medium was prepared according to Reddy et al. (30). Briefly, blood mononuclear cells were layered onto human γ-globulin-coated plates for 1 h, and nonadherent cells were washed away. The dish-adherent cells were incubated in fresh medium for 24 h. The supernatant was harvested and frozen at −20°C until use. The following recombinant human cytokines were purchased from Boehringer Mannheim (Indianapolis, IN): GM-CSF (used at a concentration of 100 ng/ml), TNF-α (2.5 ng/ml), TGF-β1 (1 ng/ml), IL-3 (10 ng/ml), and IL-4 (50 ng/ml). The sources of mAb used in our studies are listed in Table I⇓. FITC-, PE-, PerCP-, PE Cy5-, or biotin-labeled isotype-matched controls were purchased from Becton Dickinson (Sunnyvale, CA) or PharMingen (San Diego, CA). When unlabeled mAb or biotinylated mAbs were used as the primary reagents, PE-labeled goat anti-mouse IgG F(ab′)2 (Jackson ImmunoResearch, West Grove, PA), FITC-labeled goat anti-mouse IgG F(ab′)2 (Becton Dickinson), FITC-labeled polyclonal anti-rat Ig (PharMingen), or tri-color-labeled streptavidin (streptavidin-RED670; Life Technologies, Glasgow, U.K.) were employed as secondary reagents. The mAbs against Langerin (DCGM4) (31) and Lag-1 (32) were used to determine the differentiation into LCs. A cell permeabilization kit, FIX & PERM (Caltag, Burlingame, CA), was used for intracellular staining. PBMC were isolated by Lymphoprep (Nycomed Pharma, Oslo, Norway) gradient centrifugation of heparinized blood (50–60 ml) obtained from each healthy volunteer. PBMC were incubated with anti-CD3 (HIT3a) and anti-CD14 (M5E2) mAbs (both from PharMingen) for 30 min on ice, and cells binding these mAb were removed using sheep anti-mouse Ig-coated magnetic beads (M-450; Dynal, Oslo, Norway). CD3−/CD14− cells were further incubated with CD4-conjugated microbeads (Miltenyi Biotec., Bergisch Gladbach, Germany), and the CD4+ cells were then enriched through Mini MACS magnetic separation column (Miltenyi Biotec.). Using this protocol, the percentage of DCs (<1% of total PBMC) increased to 20–50%, depending on the individuals (n > 30). The resultant DC-enriched population (CD4+/CD3−/CD14− cells) was stained with PE-labeled anti-CD11c (LeuM5), FITC-labeled anti-CD1a (BB-5), PerCP-labeled HLA-DR (L243), and a mixture of biotinylated mAbs against lineage markers (CD3; M2AB, binding to a different determinant from that recognized by the previous anti-CD3 mAb, CD7; G34, CD14; UCHM1, binding to a different determinant from that recognized by the previous anti-CD14 mAb, CD16; 3G8 and CD19; HIB19), followed by RED613-streptavidin (Life Technologies). The stained cells were analyzed (or sorted for cytologic assay, T cell proliferation assay, and analyses of endocytosis) by an EPICS ELITE flow cytometer (Coulter, Hialeah, FL). Consequently, three phenotypically distinct fractions of DCs were found: CD1a+/CD11c+/lin−/DR+ (fraction 1), CD1a−/CD11c+/lin−/DR+ (fraction 2), and CD1a−/CD11c−/lin−/DR+ cells (fraction 3). The DC fractions were obtained also by a two-color FACStar cell sorter (Becton Dickinson), as follows. 1) Purification of CD1a+/CD11c+ DCs (fraction 1): after staining the DC-enriched population with PE (or FITC)-labeled mAbs against lineage markers plus FITC (or PE)-labeled anti-CD1a mAb, CD1a+/CD11c+ DCs were sorted as CD1a+/lin− cells (note that all CD1a+/lin− DCs are quite comparable with CD1a+/CD11c+/lin− DCs when analyzed after staining with anti-CD11c mAb). 2) Purification of CD1a−/CD11c+ (fraction 2) and CD1a−/CD11c− (fraction 3) DCs: the DC-enriched population was stained with FITC-labeled mAbs against lineage markers and CD1a plus PE-labeled anti-CD11c (LeuM5), and the lin−/CD1a−/CD11c+ and lin−/CD1a−/CD11c− fractions were then collected using a FACStar as fractions 2 and 3, respectively. These fractions collected using the FACStar were phenotyped. Purity of the sorted cells was always greater than 96% by reanalysis using a FACScan (Becton Dickinson). The sorted fractions, thus prepared, were then stained with PerCP-labeled HLA-DR. The cells bearing HLA-DR (DR+) were gated as DCs, and further analysis was conducted using a FACScan after staining with a panel of mAbs (listed in Table I⇑) conjugated with FITC or PE. Before staining, the cells were incubated with an excess amount of unlabeled polyclonal human or mouse Ig to block nonspecific binding of labeled mAbs. The sorted DCs were cultured in 96-well flat-bottom tissue culture plates at 1 × 105 cells/well in medium supplemented with monocyte-conditioned medium (final concentration 50% v/v) for 1–6 days. In the culture of CD1a−/CD11c− DCs (fraction 3), medium supplemented with IL-3 was used. In some experiments, a mixture of cytokines such as GM-CSF + TGF-β1, GM-CSF + IL-4, GM-CSF + TNF-α, GM-CSF + TNF-α + TGF-β1, or GM-CSF + IL-4 + TGF-β1 was used. Half of the medium was removed and replenished every 2 days. To assess endocytosis of DC fractions, FITC-dextran (Polysciences, Warrington, PA) was used according to the method described previously (33). Briefly, the cells were incubated with 0.1 mg/ml FITC-dextran at 37°C for 15 or 45 min. The results were displayed as mean fluorescence intensity after subtracting the background in which cells were incubated with FITC-dextran at 4°C. Cells were cytocentrifuged onto a slide and stained with May-Giemsa solution, or by mAb to CD68 or Lag, then visualized using the ABC method using DAKO LSAB (labeled streptavidin biotin) kit plus hematoxylin and diaminobenzidine. For electron-transmission microscopy, cells were fixed with 2.5% glutaraldehyde in 0.1 M cacodylate buffer (pH 7.4) and postfixed with 1% OsO4. After dehydration with graded ethanol, they were embedded in Epon. Ultrathin sections were stained with lead citrate and uranyl acetate, and studied using a Hitachi H-600a electron microscope (Hitachi, Ibaragi, Japan). Freshly prepared blood DCs, cultured DCs (in the presence of GM-CSF and IL-3), or blood monocytes (purified by magnetic beads as CD14+ cells) were γ irradiated at 15 Gy, and graded doses were then added to 2 × 105 allogeneic T cells (collected by magnetic beads as CD3+ cells) in 96-well flat-bottom culture plates for 6 days. The cells were pulsed with 1 μCi of [3H]TdR during the last 16 h of the culture period. For cell cycle analyses, 105 cells were suspended in 70% ethanol at 4°C for 1 h, followed by resuspension in 500 μl PBS, 250 μl RNase (1 mg/ml; Sigma, St. Louis, MO), and 250 μl propidium iodide (PI) (100 μg/ml; Molecular Probes, Eugene, OR). Cell viability was determined using Annexin V-FITC Apoptosis Detection Kit (Genzyme, Cambridge, MA). The stained cells were analyzed with a FACScan. DC-enriched populations prepared from the peripheral blood (CD4+/CD3−/CD14− cells) were four-color analyzed after staining with PE-labeled anti-CD11c, FITC-labeled anti-CD1a, PerCP-labeled HLA-DR, and a mixture of biotinylated mAbs against lineage markers, followed by RED613-streptavidin. lin−/HLA-DR+ cells (DCs) (Fig. 1⇓A) were of medium cell size (between lymphocytes and monocytes) by light scatter profiles. Two distinct populations of lin−/DR+ were observed with respect to the expression of CD11c (Fig. 1⇓B). Furthermore, CD1a (detected by mAb clone BB-5)-positive cells were newly observed as a blood DC fraction (Fig. 1⇓B). Therefore, three fractions of DCs were identified with the phenotypes of CD1a+/CD11c+/lin−/DR+ (fraction 1), CD1a−/CD11c+/lin−/DR+ (fraction 2), and CD1a−/CD11c−/lin−/DR+ cells (fraction 3). CD1a has been detected only on epidermal LCs (8, 34) and dermal DCs (10) in vivo (or on DCs derived from CD34+ progenitors (15, 16) or monocyte-derived DCs (23) in the presence of cytokines in vitro), but not on freshly isolated blood DCs (27, 28). CD1a+ DCs were also observed when a different anti-CD1a mAb (BL-6) was used (data not shown). The overall intensity of CD1a expression, however, was lower than that on CD34+ progenitor-derived DCs (data not shown) when determined by either BB-5 or BL-6 Ab. Detection and purification of DC fractions in the peripheral blood. DC fractions identified by four-color EPICS ELITE cell sorter (A and B). A DC-enriched population was stained with FITC-labeled anti-CD1a mAb, PE-labeled anti-CD11c mAb, PerCP-labeled anti-HLA-DR mAb, and biotinylated mAbs against lineage markers (CD3, CD7, CD14, CD16, CD19), followed by streptavidin-Red 613. 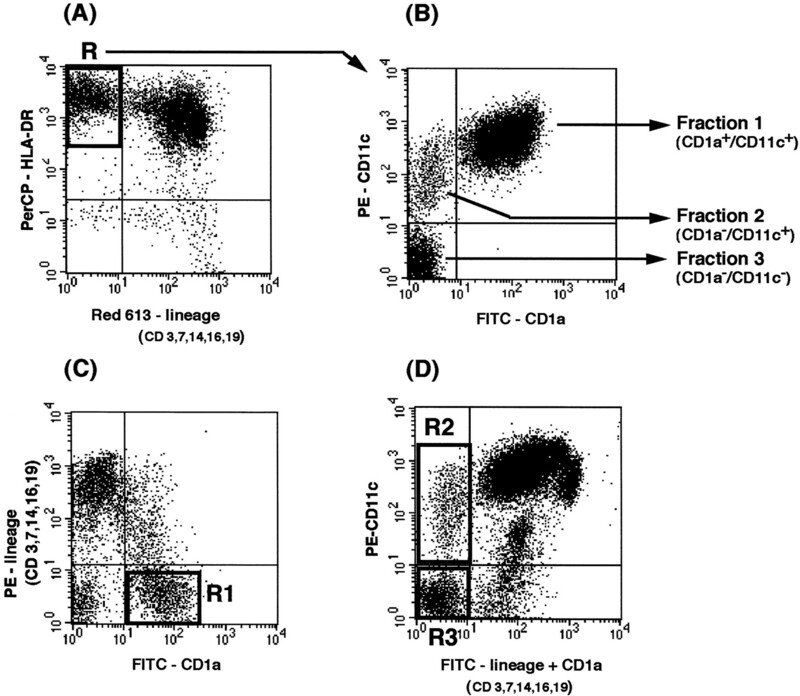 Three fractions of DC (B), detected as CD1a+/CD11c+ (fraction 1), CD1a−/CD11c+ (fraction 2), and CD1a−/CD11c− (fraction 3), are present in the lin−/HLA-DR+ fraction (designated as R in A). These three fractions of DCs were also obtained by a two-color FACStar cell sorter (C and D) (details described in Materials and Methods). Fraction 1 was sorted as lin−/CD1a+ cells after staining with PE (or FITC)-labeled mAbs against lineage markers plus FITC (or PE)-labeled anti-CD1a mAb (R1 in C). Fractions 2 and 3 were purified as lin−/CD1a−/CD11c+ cells (R2 in D) and lin−/CD1a−/CD11c− cells (R3 in D), respectively, after being stained with FITC-labeled mAbs against lineage markers/CD1a plus PE-labeled anti-CD11c mAb. Figures representative of more than 10 experiments are shown. The percentage of CD1a+/CD11c+ DCs was similar to that of CD1a−/CD11c− DCs, and that of CD1a−/CD11c+ DCs was 1/3 to 1/10 that of CD1a+/CD11c+ DCs. The frequency of DC fractions, CD1a+/CD11c+ DCs, CD1a−/CD11c+ DCs, and CD1a−/CD11c− DCs, ranged from 0.56 to 0.18%, 0.14 to 0.03%, and 0.50 to 0.13% of PBMCs, respectively, when more than 30 healthy volunteers were examined. These three fractions of blood DCs were usually purified by a FACStar, as described in Materials and Methods. Region 1 (R1) in Fig. 1⇑C shows the sorting gate of fraction 1 as lin−/CD1a+ cells (note that all CD1a+ cells are CD11c+, as shown in Fig. 1⇑B), and R2 and R3 in Fig. 1⇑D represent the sorting gates of lin−/CD1a−/CD11c+ cells (fraction 2) and lin−/CD1a−/CD11c− cells (fraction 3), respectively. Freshly prepared or cultured (for 3 days in monocyte-conditioned medium or IL-3-supplemented medium) DC fractions were examined by light and electron microscopes (EM). Freshly sorted CD1a+/CD11c+ DCs (fraction 1) (Fig. 2⇓, A and B) and CD1a−/CD11c+ DCs (fraction 2) (Fig. 2⇓, D and E) were found to be monocyte like, characterized by short cell processes, indented nucleus, high nuclear-cytoplasmic ratio, and few cytoplasmic dense bodies and vesicles, in contrast to typical DCs. After 3-day culture, both fractions showed typical DC features such as long cell processes, large cell size (Fig. 2⇓, C and F), and a prominent tubular-vesicular system (data not shown). Morphology of DC fractions. Freshly prepared or cultured peripheral blood DC fractions were histologically examined by light or electron microscopy. 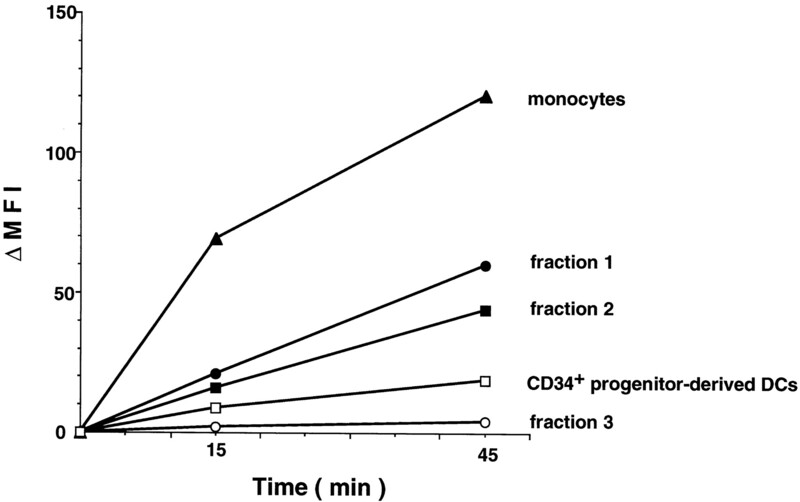 Monocyte-conditioned medium was used for the cultures of fractions 1 and 2. IL-3-supplemented medium was used for fraction 3. A–C, Fraction 1; D–F, fraction 2; G–I, fraction 3. A, D, and G, Freshly prepared DCs stained by May-Giemsa solution (×250). B, E, and H, Freshly prepared DCs examined by EM (×3000). C, F, and I, DCs, cultured for 3 days, stained by May-Giemsa solution (×250). No Birbeck granules were observed in any fractions under these conditions. Results are representative of eight experiments. 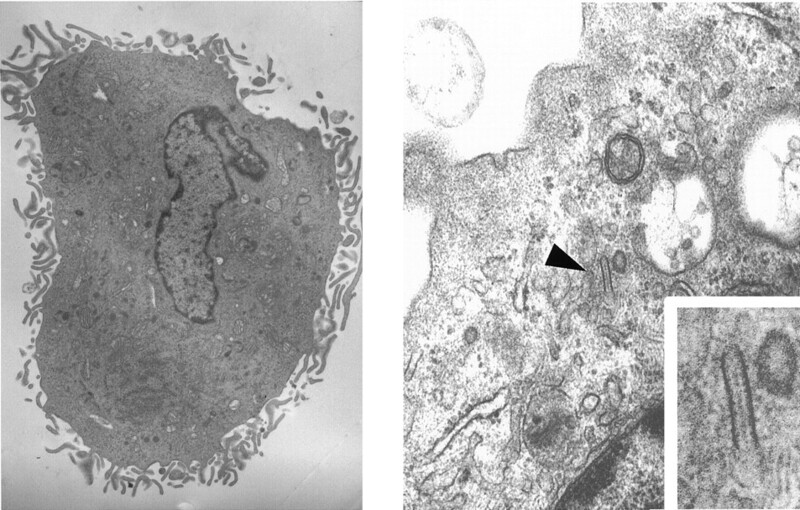 In contrast to fractions 1 and 2, freshly isolated CD1a−/CD11c− DCs (fraction 3) displayed lymphoplasmacytoid morphology; that is, a medium size with round nucleus, cytoplasm-containing juxtanuclear Golgi apparatus, and parallel arrays of rough endoplasmic reticulum (Fig. 2⇑, G and H). These cells correspond to plasmacytoid T cells within the T cell zone of lymphoid organs, as recently characterized by Grouard et al. (14). After culture with IL-3, they showed a typical DC morphology (Fig. 2⇑I) with marked decreases in rough endoplasmic reticulum (data not shown), and this process was dependent on the presence of IL-3. No Birbeck granules were found in either of the three presently identified fractions of DCs before or after culture with monocyte-conditioned medium or IL-3 (data not shown). The fluorometrical characterization of the three fractions of DCs was next conducted. The surface phenotype of the three DC fractions before and after culture is highlighted in Figs. 3⇓ and 4. The common features of these three fractions are as follows: none of the DC fractions expressed lineage markers for T cells (CD8, TCR, Thy-1/CD90), B cells (CD10, CD20), NK cells (CD56), monocytes (CD14), granulocytes (CD15, CD35), or erythrocytes (glycophorin A) before or after culture. In addition, they possessed neither CD27 and CD30 (TNF receptor families) nor CD70 (ligand for CD27). IL-1R type I (CD121a), G-CSFR (CD114), IL-2Rβ-chain (CD122), and IL-6Rβ (CD130) were negative on all freshly prepared DC fractions (data not shown). 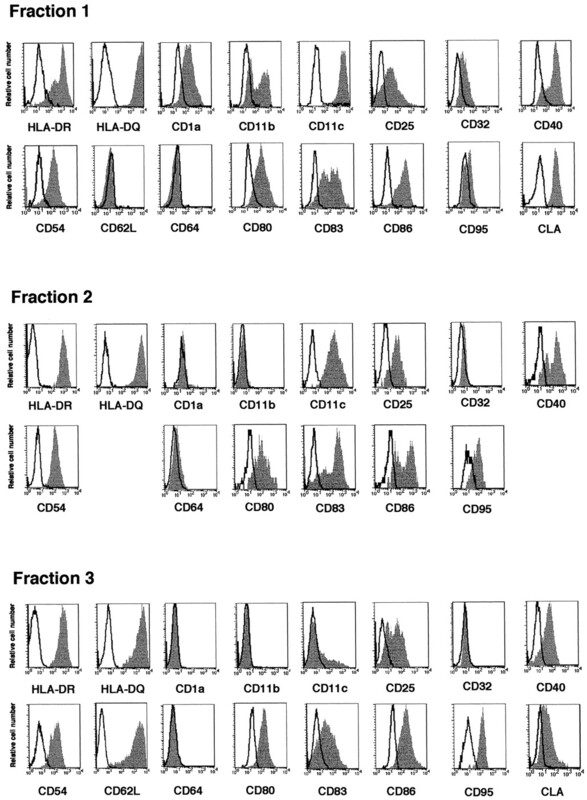 All fractions clearly expressed MHC class II, CD4, CD9, CD36, CD38, CD45, and adhesion molecules (CD11a, CD15s, CD18, CD29, CD44, CD49d, CD50, and CD54). Costimulatory molecules (CD80, CD86, and CD40) were dimly expressed on all fractions (fraction 3 little expressed CD40), and were up-regulated after culture. Activation molecules CD25 and the DC-associated marker CD83 were also detected on all fractions after overnight culture, but not on freshly isolated cells. In addition, CLA (a skin-homing molecule (35), which is constitutively expressed on LCs (36)), and L-selectin (CD62L, known to be a lymph node-homing molecule (37)) were present on all fresh DC fractions. The characteristic features of each fraction are as follows. Expression of surface molecules on freshly isolated fractions of blood DCs. Freshly prepared blood DC fractions (purified by a FACStar) were stained with anti-HLA-DR mAb and the panel of mAbs. The DR+ cells were gated and analyzed by a FACScan. Expression of surface molecules is shown as shaded histograms. Open histograms in the figures represent negative controls stained with isotype-matched control Abs. Results shown are representative of at least three experiments. DCs expressed CD33 and CD13 (myeloid-associated markers), CD2high, CD1c, CD49e, CD95 (Fas), CD45RO, CD32/CD64 (Fcγ receptors), and cytokine receptors (GM-CSFR (CD116) and IL-3Rα (moderately positive)). Furthermore, they dimly expressed CD5 and CD11b. After culture, CD11b was up-regulated, and CD32/64 was down-regulated. CD62L became undetectable during culture in contrast to freshly prepared cells. On the basis of the expressions of CD2, CD9, CD11b, CD11c, CD13, CD32, CD33, CD64, and GM-CSFR, fraction 1 is thought to be closely associated with the monocyte lineage. Actually, the phenotype of fraction 1 was quite similar to that of blood monocyte-derived DCs and that of CD34+ progenitor-derived DCs (but not LC type) (16). In contrast to fraction 1, CD1a−/CD11c− DCs expressed dimly or little CD33, CD13, CD1c, CD2, CD49e, CD45RO, CD32, CD64, but were significantly positive for CD45RA. In comparison with the other two fractions, they were highly positive for CD4, but moderately positive for HLA-DR/DQ. They also possessed IL-3Rα (brightly positive), but not GM-CSFR. Fraction 3 brightly expressed intracytoplasmic CD68, but the other two fractions were only weakly positive (data not shown). Therefore, fraction 3 is closely related to previously reported plasmacytoid T cells, not only morphologically but also according to phenotypical features. Furthermore, freshly prepared fraction 3 had no CD95. However, CD95 was induced during 3-day culture with IL-3, whereas the expression of CD62L remained unchanged. When compared with culture in medium alone, this fraction exhibited increased levels of CD83 and HLA-DR/DQ in the presence of IL-3 (data not shown). DCs were a minor population, and uniformly expressed CD11c and CD33, like fraction 1. However, they were found to be heterogeneous in the expression of some surface molecules such as CD2, CD13, CD45RA, CD45RO, IL-3Rα, and GM-CSFR, although they were morphologically homogeneous. Fraction 2, in contrast to fraction 1, had no CD1a, CD1c, CD11b, or CD64. However, they had CD11c, CD33, CD13, and GM-CSFR, indicating that they were monocyte-lineage cells. Based on the expression of the CD2 molecule, fraction 2 could be divided into two minor subfractions: CD2high and CD2low DCs. After purifying these two populations and staining them with a panel of mAbs, we found that the former were CD13low/CD45RA+/CD45RO−/GM-CSFR+ (bright)/IL-3Rα+ (bright). On the other hand, CD2low DCs were CD13high/CD45RA+ (dim)/CD45RO+/GM-CSFR+ (dim)/IL-3Rα+ (dim). Therefore, both subpopulations in fraction 2 seem to be related (but not completely matched) to fractions 1 and 3 on the basis of the expression of surface molecules. The physiological features of the heterogeneous fraction are unknown at present. Finally, CD1a molecules were not induced on the CD1a− cells even when both fraction 2 and fraction 3 were cultured with monocyte-conditioned medium or IL-3-supplemented medium, respectively (Fig. 4⇓), or with any combinations of cytokines examined (GM-CSF, IL-3, TNF-α, and TGF-β1) (data not shown). Expression of surface molecules on cultured blood DC fractions. Cultured blood DC fractions were stained with anti-HLA-DR mAb and a panel of mAbs. The DR+ cells were analyzed by a FACScan. 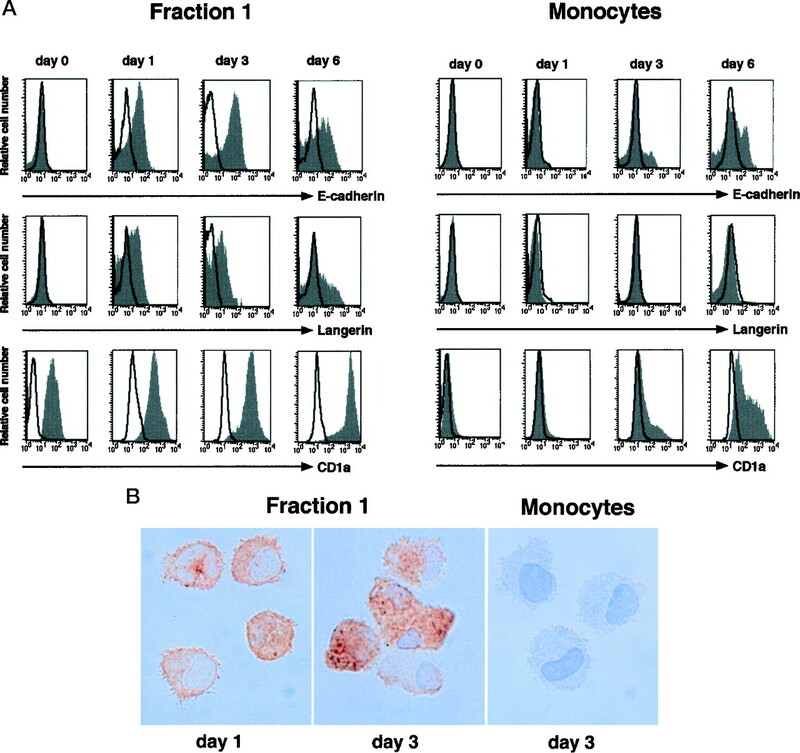 The three fractions of DCs were cultured for 3 days with monocyte-conditioned medium for fractions 1 and 2, and IL-3-supplemented medium for fraction 3. Results shown are representative of at least three experiments. The stimulatory activity for allogeneic T cells was compared among the three DC fractions, as shown in Fig. 5⇓. The order in the stimulatory activity of freshly prepared fractions was as follows: fraction 1 = fraction 2 > fraction 3, being dependent on the order of the expression of MHC class II molecules. The stimulatory activities became stronger after culture for 3 days with GM-CSF plus IL-3 (note that fractions 1 and 2 are dependent on GM-CSF, and fraction 3 is dependent on IL-3), indicating that they become mature DCs. Stimulatory activity of blood DC fractions. Graded doses of stimulator cells (freshly sorted DC fractions or cultured DC fractions in the presence of GM-CSF and IL-3 for 3 days) were irradiated and cocultured with 2 × 105 allogeneic CD3+ T cells for 6 days. Cells were then pulsed with 1 μCi of [3H]TdR during the last 16 h of culture. CD14+ monocytes (purified using magnetic beads) were also prepared and used as stimulators. Dashed lines represent freshly prepared DCs and straight lines show cultured DCs. Fraction 1 (•), fraction 2 (▪), fraction 3 (○), and monocytes (▴). Vertical bars represent SDs of triplicate cultures. Representative data of three experiments are shown. The capacity of the DC fractions for endocytosis was examined by uptake of FITC-dextran. As shown in Fig. 6⇓, freshly isolated fractions 1 and 2 had a potent ability to endocytose FITC-dextran during a 45-min incubation compared with CD34+ progenitor-derived mature DCs, although this capacity was less than monocytes. The endocytic activity of fractions 1 and 2 decreased after culture for 3 days with monocyte-conditioned medium (data not shown). Fraction 3, which had been freshly isolated or cultured (with IL-3), showed little FITC-dextran uptake. Analysis of endocytosis. Fractions of DCs were incubated with 0.1 mg/ml FITC-dextran at 37°C for 15 or 45 min. After washing three times, uptake of FITC-dextran was analyzed by a FACScan. The results are shown as mean fluorescence intensity, from which the background fluorescence (incubated at 4°C) is subtracted. CD34+ progenitor-derived DCs were obtained by the culture of CD34+ progenitor cells collected from the human umbilical cord blood samples (according to institutional guidelines) for 12 days in the presence of GM-CSF and TNF-α (16 17 ). Fraction 1 (•), fraction 2 (▪), fraction 3 (○), monocytes (▴), and CD34+ progenitor-derived DCs (□). Results shown are representative of three experiments. It should be noted that no Birbeck granules were found in CD1a+/CD11c+ DCs (fraction 1) before or after culture with monocyte-conditioned medium. To further characterize fraction 1, we compared the effects of combinations of cytokines (GM-CSF + TGF-β1, GM-CSF + IL-4, GM-CSF + TNF-α, GM-CSF + IL-4 + TGF-β1, and GM-CSF + TNF-α + TGF-β1) on their maturation and differentiation. The expression of E-cadherin, the LC-restricted Langerin (detected by mAb DCGM-4), and Lag Ag was kinetically examined. In the presence of GM-CSF + IL-4 + TGF-β1, E-cadherin and Langerin were detected (Fig. 7⇓A) already after 1 day of culture, and intracellular Lag was also slightly positive both in FACS (data not shown) and cytochemical (Fig. 7⇓B) examinations. Expression of the LC-specific molecules increased at 3 days, as shown in Fig. 7⇓. Finally, fraction 1 showed DC morphology, and typical Birbeck granules were observed 6 days after culture (Fig. 8⇓). In addition, the intensity of CD1a expression increased concomitantly (Fig. 7⇓A). Differentiation of fraction 1 DCs to LCs in the presence of GM-CSF, IL-4, and TGF-β1. A, Induction of LC-specific molecules on fraction 1 DCs. 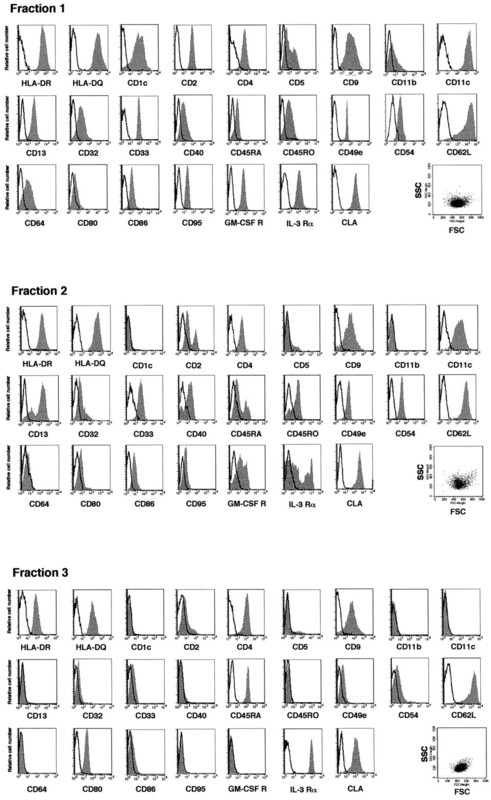 DCs (fraction 1) and CD14+ monocytes were cultured in the presence of GM-CSF, IL-4, and TGF-β1 for 6 days, and cells harvested daily and stained with anti-E-cadherin, anti-Langerin (DCGM-4), or anti-CD1a (BB-5) and anti-HLA-DR mAbs. The DR+ cells were gated and analyzed by a FACScan. The expression of E-cadherin, Langerin, or CD1a is shown as shaded histograms. Note that E-cadherin and Langerin were induced on fraction 1 DCs already after 1 day of culture. Open histograms represent negative controls stained with isotype-matched control Abs. B, Histocytochemical examination of Lag in fraction 1 DCs cultured in GM-CSF, IL-4, and TGF-β1. Cultures were cytocentrifuged and stained with mAb against Lag. Original magnification: ×250. Results shown are representative of three experiments. Morphology of fraction 1 DCs cultured for 6 days in the presence of GM-CSF, IL-4, and TGF-β1. Typical Birbeck granules (arrow and inset) are observed (∼20–25% of cultured DCs) by EM examinations. Original magnification: left, ×6,000; right, ×12,000; inset, ×20,000. It should be noted that, regardless of the time point examined, differentiation to LCs from fraction 1 was only observed with the combination of GM-CSF + IL-4 + TGF-β1, but not with any cytokine alone nor any combinations tested. Of importance, neither fraction 2 nor 3 had the capacity to differentiate into LCs when cultured with GM-CSF + IL-4 + TGF-β1 or other cytokines tested (GM-CSF, IL-3, TNF-α, and TGF-β1) (data not shown). Furthermore, induction of LC-specific molecules was not observed in CD14+ monocytes during culture with the same cytokine combination (GM-CSF + IL-4 + TGF-β1). On day 6, E-cadherin and CD1a became positive, as has been reported by Geissmann et al. (24); however, the more sensitive Lag and Langerin markers were not detected in our culture condition (Fig. 7⇑). Furthermore, when we examined the frequency of dividing cells (evaluated by PI staining) and viable cells (evaluated by PI and annexin V staining) before and after the culture, the percentages of dividing cells were less than 1% (before and after 1-, 3-, and 6-day culture), and the percentages of viable cells were more than 90% throughout the culture period (data not shown). In addition, 15 Gy irradiation did not alter LC differentiation from fraction 1 (data not shown). 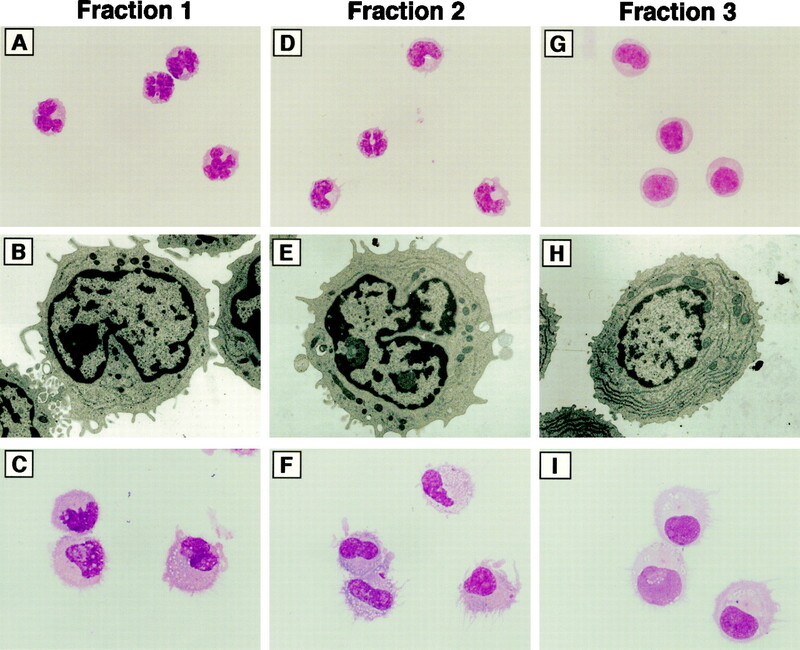 These findings clearly demonstrate that 1) fraction 1 has the capacity to differentiate into LCs without cell proliferation, and 2) fraction 1 is the direct/immediate precursor of LCs, compared with monocytes. As shown in Fig. 9⇓, 3 days after culture in the presence of GM-CSF, IL-4, and TGF-β1, fraction 1 DCs expressed higher intensities of cutaneous lymphocyte-associated Ag and CD1a, with lower HLA-DR, CD54, CD40/CD80/CD86, and CD83 (mostly negative, a few positive) than those cultured with monocyte-conditioned medium. Activation-associated markers, CD25 and CD71, were not induced, and CD2 was down-regulated in contrast to the cells before culture. Furthermore, CD23 (FcεRII) was induced on fraction 1 under this condition (but not with monocyte-conditioned medium), as reported by Schmitt et al. (38) on LCs. These findings suggest that the combination of IL-4, GM-CSF, and TGF-β1 is essential for differentiation of fraction 1 into LCs rather than terminal maturation and/or activation. Phenotype of fraction 1 DCs after culture with GM-CSF, IL-4, and TGF-β1. Fraction 1 DCs were cultured with GM-CSF, IL-4, and TGF-β1 for 3 days, and the cells were harvested and stained with the mAbs listed in the figure. The DR+ cells were gated and analyzed by a FACScan. Shaded histograms represent expression of the surface molecules, and open histograms represent isotype controls. Representative results of three experiments are shown. Our results represent the first observation showing that LCs can originate from DCs circulating in peripheral blood, as their direct precursors. We have identified three fractions of DCs in the peripheral blood using a panel of mAb. Two of these fractions, fraction 1 (CD1a+/CD11c+ DCs) and fraction 2 (CD1a−/CD11c+ DCs), showed more potent APC activity and monocyte-like morphology. Fraction 3 (CD1a−/CD11c− DCs) displayed poor endocytic activity and a lymphoplasmacytoid morphology. All fractions were confirmed to exhibit dendritic morphology and acquired CD83 during culture. As previously reported, less mature APCs in the blood, with little expression of CD11c and CD33, have been speculated to be on the way from the bone marrow to nonlymphoid tissues such as the skin, and more mature potent APCs bearing CD11c and CD33 are thought to be en route to the lymph nodes from the skin (27). When freshly isolated, these DCs display immature dendritic morphology and express CD4 (5, 27), but not CD83 (26, 39), in agreement with our results (Figs. 2⇑ and 3⇑). Notably, DCs in the blood have been found within a CD1a-negative fraction (26, 27, 28, 39). However, we have identified one fraction of DCs as CD1a low-positive cells (fraction 1). The difference in detection of CD1a between our present results and previous studies could be due to the following: 1) in previous studies, T cells were depleted by SRBC-rosette formation, and this caused the depletion of some DCs bearing CD1a because this DC population coexpresses CD2 (binding site of SRBC) (5, 26, 27); 2) part of the CD1a+ DC fraction coexpressing CD11b might be depleted along with myelomonocyte-lineage cells when anti-CD11b mAb was used in immunoselection (29, 39, 40); 3) the level of CD1a expression on this fraction is much lower than that on the CD34+ progenitor-derived DCs or monocyte-derived DCs; therefore, CD1alow+ DCs were classified as CD1a-negative cells; in this context, Brown et al. reported that CD1a was weakly expressed on a small amount of blood DCs (41); and 4) different anti-CD1a mAbs employed in detection, this being considered to be a main reason. In our study, a difference in the intensity of CD1a was actually observed when two anti-CD1a mAbs (clones BB-5 and BL-6) were compared. The CD11c+/CD33+ DC subset in the blood that O’Doherty et al. (27) and Thomas et al. (28) previously identified might contain fraction 2 (CD1a−/CD11c+ DCs) and a part of fraction 1 (CD1a+/CD11c+ DCs). In their studies, CD1alow+ DCs might be classified as CD1a-negative cells. Fraction 1 is morphologically similar to monocytes and, after culture, the cells resemble monocyte-derived DCs. Furthermore, fraction 1 has myelomonocyte-associated Ags, and has the capacity to uptake FITC-dextran. These findings indicate that fraction 1 is a homogeneous subset, and most likely a CD14-negative monocyte-associated or monocyte-derived DC. Strikingly, cells in fraction 1, but not fraction 2 or 3, rapidly became cells with typical LC characteristics in the presence of GM-CSF, IL-4, and TGF-β1. E-cadherin (Fig. 7⇑A) and Lag (Fig. 7⇑B) were detected after short-term culture, and the newly described LC-specific Ag, Langerin (31), was concomitantly induced (Fig. 7⇑A). Furthermore, the differentiation of LCs from fraction 1 was confirmed by the appearance of Birbeck granules (Fig. 8⇑). DCs bearing CD1a are induced from CD14+ blood monocytes after culture with GM-CSF and IL-4 (23, 33). Geissmann et al. (24) have recently reported that blood monocytes differentiate into LCs after a 6-day culture in the additional presence of TGF-β1. We did not observe acquisition of a complete LC phenotype from CD14+ monocytes in our culture condition (Fig. 7⇑). Furthermore, the differentiation of LCs from fraction 1 occurred during a very short-term culture. In addition, the possibility that a dividing or a distinct subpopulation in fraction 1 selectively differentiates into LCs was ruled out by the following: there was <1% of dividing cells, there was a low cell mortality rate, and a low rate of apoptosis throughout the short-term culture. Therefore, fraction 1 is a distinct direct/immediate precursor of LCs in the peripheral blood, and might be an intermediate stage between monocytes and LCs. LCs are myeloid-lineage DCs that originate from the bone marrow. However, little is known about their migration/differentiation pathway. Our results might help elucidate this question, as fraction 1 is the direct precursor of LCs (in response to GM-CSF + IL-4 + TGF-β1) and a bipotent cell that can be induced to differentiate into non-LCs such as dermal DCs (in response to monocyte-conditioned medium). This indicates that common precursors for the LC lineage and the monocyte-associated DC lineage are present in the peripheral blood. It can be speculated that part of this fraction migrates to the epidermis to differentiate into LCs, and that the other migrates to nonlymphoid tissues such as the dermis and differentiate into dermal DCs. This process might be dependent upon cytokines produced by regional microenvironments. Fraction 3 (CD1a−/CD11c− DCs) is another homogeneous subset in the peripheral blood, and distinct from fraction 1, based on its morphology, the expression of lineage-associated Ags, lack of ability to uptake FITC-dextran, and dependency on IL-3. From our detailed studies on blood DCs, the features of fraction 3 correspond completely to those of plasmacytoid T cells in the T zone of the lymphoid organ (found to be close to or within the high endothelial venule) that could be derived from CD4+/CD11c− blood DCs (14). Fraction 3 possesses high levels of the lymph node-homing molecule; CD62L, and its expression, remains unchanged during culture, although it is down-regulated on fraction 1 (Figs. 3⇑ and 4⇑). These findings support the possibility that fraction 3 in the blood may be a precursor pool for plasmacytoid T cells that directly migrate to the T zone in the lymphoid tissues via the high endothelial venule. Furthermore, fraction 3 requires IL-3, but not GM-CSF, for cell maturation and development, whereas typical myeloid-lineage DCs are known to be dependent on GM-CSF, indicating that fraction 3 is not in the monocyte-associated DC lineage. Grouard et al. have pointed out that plasmacytoid T cells in the lymphoid organs are lymphoid-derived DCs for this reason (14). However, fraction 3 also expresses several myelo-monocytic markers (CD9; Fig. 3⇑, CD36 and CD68; data not shown); therefore, it is not evident at the moment whether they indeed are lymphoid-derived DCs. This issue will require further studies on these cells. Our results clearly indicate that fraction 3 is a different lineage from that previously examined in in vitro differentiation studies of CD34+ progenitors to LCs or dermal DCs. Although examination of the minor fraction, fraction 2 (CD1a−/CD11c+ DCs), has been hampered by the limitation of cells collected from the peripheral blood, this fraction has similar features to fraction 1 in their morphology, allostimulatory activity, and the expression of several myelo-monocytic Ags, suggesting that cells in this fraction are monocyte-associated or monocyte-derived DCs, or that they are in an intermediate stage preceding fraction 1. Furthermore, fraction 2 is phenotypically similar to recently reported DCs located in the germinal center (GCDC) (13); therefore, the possibility exists that fraction 2 becomes GCDCs, which have been presumed to be derived from blood CD4+/CD11c+ DCs. In summary, we have characterized three fractions of DCs in the human peripheral blood using a panel of mAbs. It is noted that fraction 1 has the capacity to become LCs. These results suggest that blood DC fractions (subsets) are different not only in their maturational stages, but also in their lineage or differentiation pathways. Our studies of the DC fractions were conducted using healthy volunteers. Therefore, the findings in this study also offer basic data for the diagnosis of some immune-related diseases. We are now proceeding with experiments related to these points. We thank Y. Tokuyama and M. Shinkawa for their skillful technical assistance, F. Ishida (Central Research Center, Kansai Medical University) for sorting cells on a FACStar, and K. Ando for manuscript preparation. We thank Dr. S. Imamura and Dr. K. Yoneda (Faculty of Medicine, Kyoto University) for anti-Lag 1 Ab. ↵1 This work was supported by a grant from the Ministry of Health and Welfare’s Study Group on Specific Diseases Research and by grants from the Ministry of Education, Science, and Culture, and the Japan Private School Promotion Foundation. ↵3 Abbreviations used in this paper: DC, dendritic cell; EM, electron microscope; LC, Langerhans cell; PerCP, peridini-chlorophyll protein; PI, propidium iodide.